Having established the strong possibility that I run on the villainous side of life, I started wondering if my current set-up really reflected the ‘true’ me. The first step for any self-respecting serious arch-nemesis is establishing a sufficiently intimidating hidden base. The problem being the obvious choices are so passé and bothersome: the moon-base that no visitors can reach, the volcano where every rumble raises the question ‘is it really extinct?’, the under-the-sea-cave that springs a leak very time there is the slightest earth tremor, the dessert island where you have to supply your own booby-traps or the concrete bunker that won’t get wifi. No, all of these lack what the new age of super-villain demands today. We need amenities. We need to be close to parks where we can walk the hounds of hell, a choice of schools for our darling spawn of evil, space where our minions can have some well-deserved R&R after a hard day trying to take over the world. To this end, I give you the Shopping Centre. As a member of the commercial community you can harness synergies to bring down costs while increasing productivity. A prebuilt unit, constructed under consultation with top security advisers, means a rotating shift of as few as five henchmen will be required to maintain security. “You’ve Been Framed”: What Should You Do Now? “But won’t everyone see my operation and nefarious plotting?” I hear you ask. No, with their fully customizable store front, the public will pass unaware of the scheming within. Any hero who should pass the door will have to navigate such horrors as ‘helpful assistants’, ‘disorientating lighting’, ‘a clawing stench’, ‘customer selfie sticks’ and ‘constantly moving stock’ before they breach the first line of defense. The future is now. The future is a destination whose catchment area reaches well beyond the Pale. The future is The Shopping Centre. I think once you have been guilty of hiding a pregnancy until week 12, the stigma of that crime does not leave you until menopause. I find no matter where I am, anything I do has to prefaced with “I’m not pregnant”. And I can tell that half of you here at the bottom are thinking “-but is she actually pregnant”. It’s a crime that never leaves you. When are you having the next? If there was such thing as Maternity Ward bingo* this would be the big winning square in the middle – that is, how soon a mother is asked “When are you having the next?” after giving birth. The baby is almost fresh from the womb, being cleaned and the family notified, when some idiot pipes up “oh you can’t leave them on their own – you’ll have to get them a little brother or sister, a little friend.” As if you can pop down to Argos and order one over the counter. Right now, I would rather buy my son friends than have to grow him one. I would rather spoil him rotten, buy him every crazy gimmick, every overpriced toy that comes along, so all the other kids with several siblings want to play with his new toys and hopefully by extension him (in this plan I’m hoping he won’t be that bright, so it might take him several years to figure out that these are not real friends). I have a friend who has three under the age of five, and before I had mine I had no idea what a feat of human resilience she was exhibiting on a daily basis by not hiding under her bed and hoping they would all go away. Watching her with those kids is like watching someone walk a tightrope – it’s amazing, it’s death-defying and I am definitely not having a go. Every so often I think, maybe we could have another when my son is out of nappies, or maybe when he starts school, or maybe after he does his communion or confirmation. And then I realise that I will be too old at that stage to be even worrying about it. Worrying about how I would survive if I got a second non-sleeper, or how would I keep track of an energetic toddler while lugging around a big pregnant belly, or how would I survive another mind-numbing maternity leave? *Maternity Ward Bingo – if it’s not a thing, I’m going to invent it – a million dollar idea if ever I’ve heard one! I envy both true atheists and believers alike. They know where they stand and they are not for turning. It’s a little harder for us fuzzy fakers on the fence of religion. I like to think of myself as a ‘spiritual being’ but a little like ‘conscious uncoupling’ – it’s just a just a fancy way of saying ‘God seems like he might be a bit of alright, but I can’t commit to hanging out every Sunday.’ Also, these days, I think he is getting a few things wrong, but chastising your deity regularly is probably not the way to endear yourself to them. Nobody likes a nag who always knows better, and I don’t need a pissed-off God working against me right now. Having being dragged up Catholic, for me going to mass is a little like visiting an elderly relative who repeats the same stories over and over again. However, I recognise the reality of the world I live in, and while it’s fine for me to be ambivalent towards religion, my ambivalence is not okay for my son. The good school in my area is Catholic and their enrollment policy requires a baptism certificate. Sure, I could argue against the discrimination with an army of solicitors, but it is cheaper to just get him Christened. The Grandparents who are true believers will be trilled as their grandson’s immortal soul is no longer going to hell. My son gets to do those other rites of passage, such as communion and confirmation, and I can’t wait to see him in a cute little suit. Each rite of passage comes with a day out – and an excuse for the extended family to get together. My son gets Godparents, traditionally the unfortunate sods who gets custody of my son should the husband and I get knocked over by a bus, but who also give enhanced presents at Birthdays and Christmas. However, these side benefits are not my main reason for choosing a religious upbringing for him, my main reason for choosing it is to bore him to death by it. I feel that he is less likely to be hypnotised by the lure of a cult if somewhere in the back of his mind he knows ALL religions eventually involve a boring repetitive ceremony that has to be endured, when you’d rather be doing something more exciting. Nothing demystifies a charismatic spiritual leader quicker than realising he has a faint whiff of Catholicism about him, but one would need a certain familiarity with Catholicism to recognise this before you hand over your life savings. Now comes the hard part – does this mean I will actually have to drag myself to church on a Sunday so he becomes familiar with the ritual? Do I have to learn the new words for mass and acknowledge that Vatican II happened? 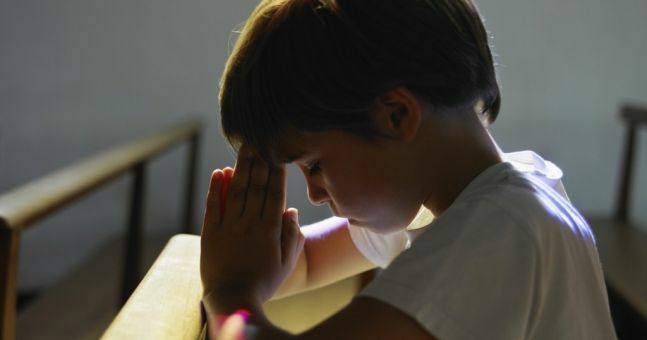 Or can I wait until he is four or five (or maybe six or seven) before I start – it’s not like he is going to remember the early years anyway, and it’s not like the Catholic Church are closing for business any time soon. Or will he become strangely intrigued by the sacraments if it’s something we start later in his life? True believers and atheists don’t have to contend with these sorts of questions. 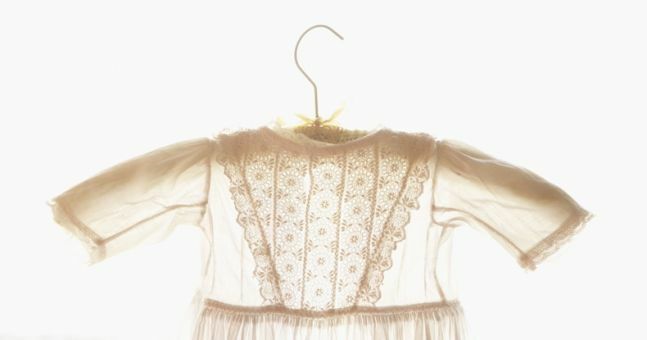 Organising a Baptism or a Christening? Having decided my son was going to follow the footsteps of his forefathers into Catholicism, the next step was to get him christened. I had not attended a christening since my own so I had no idea what to expect. Not being a regular down at Mass since I was 15, I felt a like Canal Street counterfeit nested among the Prada in BTs, as I sat waiting until I could go up and ask the priest how to arrange the christening. So you don’t have to endure this discomfort, I have a mini-series to help you on your way. First thing, lets understand the terms – nothing says ‘I’m a Christmas-Mass-Only Christian’ than getting the lingo wrong. Baptism is a religious ceremony when a baby is welcomed into the Church. Christening is the giving of a name at the time of baptism. For babies, ‘to be baptised’ and ‘to be christened’ are almost interchangeable and you may use either. They belong together. Secondly, there is no rush. Catholicism has been around for 2015 years, the church at the end of your road has probably been there since St Patrick was wandering about. None of it is going anywhere. There was a rush in the old days to get the child christened because there was a belief that un-christened souls had original sin that if not absolved condemned the soul to purgatory and the body to a separate area in the cemetery. Grisly stuff. The Church has wisely done a total U-turn on this guff. There is no more purgatory. (What happened to all the souls who were floating around there? Who knows, apparently it’s impolite to ask.) There is no more original sin and thank Jesus, medical science and human ingenuity, the death rate in children has dramatically decreased here in the first world. All this means there is no rush for the Christening. We waited until my son was six months old, which gave plenty of time for me to recover and for us to get used to him and his ways. The only thing I would say is that once they are mobile, few babies are content to sit still for too long, so there is a sweet spot where they are big enough, but not too big, that I would be aiming for – somewhere between starting to roll and starting to crawl. What to buy the newborn that has everything? First things first, and let’s get this out in the open, we’re among friends here, it’s always nice to get a present – any present. The best present you can get new parents really hinges on one question: when are you likely to see the young* couple post-birth? If you are one of the select few who are likely to see them at home in the first few weeks following the birth, then there is only one gift to bring – food that either cooks itself or has minimal effort attached. By this I mean a homemade lasagne that can be microwaved; store-bought or pre-packaged prepared meals that only need to be thrown in the oven for an hour; a pre-washed and prepared salad with two slabs of meat that just need to be grilled. Basically anything that will give the new parents the sense of a hearty homecooked meal with minimal time and effort. Food aside, this is the next best present: one is an overpriced piece of rubber and the other is illegal in this country, but together they represent all your teething-problem solutions. The Calgel numbs the pain and is suitable from six months and over (other teething products in this country are only recommended from around two years and over); while Sophie the giraffe is chewable from all angles and easily washed after being flung across the room. These items are essential to ease the pain of emerging teeth. 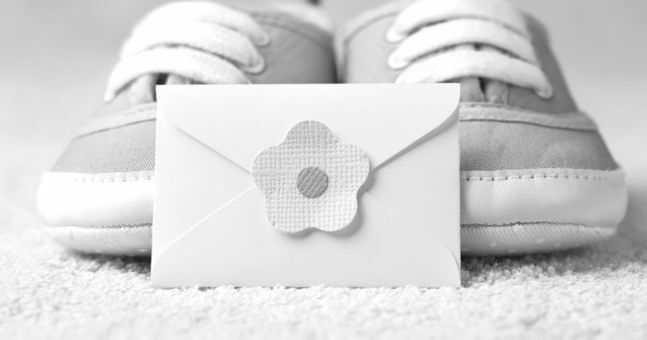 Very few new parents have the time or interest to exchange or return gifts, so there is no need to leave the tags on. Anything that goes against a baby’s skin or into their mouth needs to be washed before use. God knows if the item was lying on some rat infested factory floor before being packaged, shipped and sold, so unless you know exactly where it’s been the whole time, it needs to be washed. Pop anything you buy into a 30 degree slow-spin wash with some non-bio detergent and stick a label on it to let the mum know that you have done so. That way the baby will be able to use it straight away. Not only have you given a great gift, but you also have not caused extra laundry – kudos to you. Not all babies come out standard sized…. stick with me. Some have long legs, others short arms, others short torsos, some big heads. Mostly it’s not noticeable (especially in the start when all babies wear are baby-grows, cardigans and hats), but eventually, when you have rolled the sleeves up for the millionth time, or had to cut the feet out of every baby-grow, then you start to wish you could get clothes that actually fit your young one. This is where handmade clothes come into their own – knitted cardigans that are long enough in the body but shorter in the arms, crocheted jumpers that have wide necks that can stretch over a head easily. Check out Grandma Knits For Baby on Etsy for a great selection (shameless plug, but honestly totally worth it). It is not possible to have enough of these. Babies are constantly emitting some sort of drool, snot, vomit, sick-up, what-have-you. Gifting someone 20 or 30 of these is not excessive – although I warn you the soft ones are only sold in packs of three, which makes them pricey little buggers. Comedy ones are cute, but easy to get on and off Velcro ones are the overall winner here. (Plus, comedy might be a strong word for these greeting card witticisms.) Wash as above before gifting for extra points. Be it your style or the parents style; rockers get Megadeath t-shirts, county fans get a plaid shirt, ravers get neon pants with led lights on the bum (people who are too young to remember these social categories, even vaguely, are too young to be having kids). These little outfits are cute and funny on their own, but if the parents are getting baby photos done, then they come into their own. Try to avoid ‘Mommy’s little whatever’ or ‘Daddy’s special what-have-you’ etc – it’s too cutesy. A tip on sizing: Most babies grow fast, and a few show up bigger than the ‘newborn’ size, so at the very least get 0-3 month clothes, however, lots of people like to get clothes a lot bigger and I think that is a great idea – just be careful of the seasons – there is no point in buying a winter baby a snowsuit in 6-9 months because it will be summer by the time they are in that size. Try to get something that is good for all seasons. Although most mums are happy for the baby to be the focus of attention, it can be nice to get a little token for the mums too. Bath-soaps and lotions are an old favourite; just avoid anything strong smelling that might interfere with bonding. Foods that she loved pre-pregnancy, which turned her stomach during the pregnancy, might be fun to try again – just be mindful of foods that should be avoided while breastfeeding if she is taking that route. If you are close to the parents; an offer of an hour’s sleep could be nice, or staying with the baby while they take a walk, get a coffee, pack bags and plan to leave the country, whatever. *If you are young enough to be the parent of a newborn, you are young enough to be called young, we will have no ageism here. We are a hairy family. I wish there were a more elegant way of saying it, but there isn’t. We are not Teen Wolf hairy, people don’t have the urge to scratch behind our ears, but in all the generations I have met there hasn’t been a baldy amongst them. My son has inherited this trait. He was born with a fine head of hair, he lost that and has now grown back a flocculent masterpiece that even Fabio would be envious of. This is the sort of hair that if styled right could get a person elected President. Unfortunately, I just don’t have the time in my life for styling a 10-month-old baby’s hair. I haven’t time to style my own, and I certainly don’t have time to style his. I see other little boys in the playground with their long pre-Raphaelite golden curls trailing down their shoulders, and think I think ‘if only their Mammy had a little girl, there would be no need for that nonsense’. I am a short-back-and-sides sort of lady (despite falling for a long-haired rocker, but that is a story for another day) so as soon as my son’s hair started to tuft over the top of his ears, I got out the hair scissors and ‘feathered’ it so that it sat behind his ears. However, now that his fringe is in his eyes and curls are slipping down the nape of his neck behind his shirt collar, it’s time to call in the professionals. 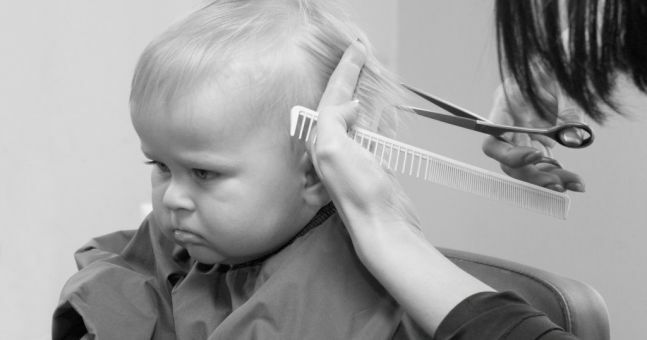 At 10 months very few hairdressers would consider cutting his hair because at that age his skin is very thin, he moves at unpredictable angles unexpectedly and is fascinated by anything that touches his head and wants to look at it. This makes for a very difficult client. However, I eventually tracked down a lovey hairdresser with two young sons of her own who agreed to give it a go. I sat in the hairdressers’ chair, my son on my knee; I amused him and she chopped away. That was it. After months of searching, enquiring and asking she was done in less than 5 minutes with no drama. If we were in a reality TV series this event would be edited out. The result wasn’t breath-taking, it was simply shorter. He did not lose the strength of Samson or the top of his ear, just the ends of his hair. We dusted him off and went home, with an arrangement to come back to her in a few months’ time. An anti-climax or talented, experienced hairdresser? Either way my son no longer looks the unkempt lead singer of a Brit Pop band, so the tale ends quietly and happily.